The SwitchView DT KVM switch doubles as a monitor stand and allows you to control a combination of four desktop PCs or laptop computers with one keyboard, monitor and mouse. With zero footprint, the SwitchView DT KVM switch frees up valuable desktop space for other uses and you work more efficiently because every computer is right at your fingertips. The SwitchView DT KVM switch is simple to install and front-panel LEDs show you which computers are online and which one is currently selected. SwitchView KVM switches offer affordable switching solutions for today's home offices and small offices. SwitchView KVM switches are easy to install. Some models let you share speakers and a microphone between PCs. A USB hub and/or support for DVI high video resolution are available on other SwitchView switches. 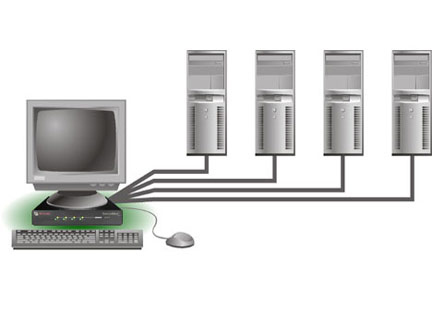 Compact, space-saving KVM switches eliminate desktop clutter and provide efficient PC access. Laptop friendly design controls desktop and laptop PCs alike with one set of peripherals. PC access You can access four PCs from a single keyboard, monitor and mouse. Ease of installation Color-coded connectors and cables for easy installation. No software to install or DIP switches to configure. Ease of use: Front-panel LEDs show you which computers are online and which one is currently selected. Space saving Fewer peripherals means more desktop space. The SwitchView DT switch has a zero desktop footprint as it doubles as a monitor stand. Hot-plug capability: You can add or remove a desktop PC or laptop without powering down the switch or other attached servers. Question: How do you connect this switch to a laptop? Answer: Thank you for your inquiry. You would simply connect the VGA, and PS/2 mouse and keyboard cables to the switch and the laptop. If the laptop is newer, without PS/2 ports, you may be able to use PS/2 to USB adapters for the keyboard and mouse. However, we are not certain that PS/2 to USB adapters will provide acceptable performance or even work at all. Additionally, we have uploaded the appropriate SwitchView manual for your convenience. Answer: Thank you for your inquiry. Using the keyboard to switch ports on this particular Avocent KVM is accomplished by the following hot-key sequence. Pres the Control key [Ctrl] twice to enter "Command Mode", then press the letter for the desired target computer A-D, followed by the enter key. Additional Hot-key commands can be found in the manual linked above. Question: I am searching for a German Handbook for Avocent SwitchView 4 Ports PS2 . Can you tell me where I can find this download in internet? Thank you very much for answer.